*note: dw & i like to have dessert after dinner and well i needed a really quick, one dirty bowl sweet recipe. this was it. i previously made coconut macaroons that used only egg whites. 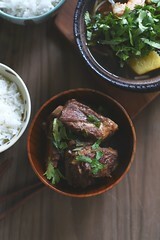 this recipe, thankfully, let me use the whole dang thing and it came out just lovely. in mixing bowl mix everything, except for the chocolate. you’re not aiming for a batter, it’s more like clumps of moistened coconut. 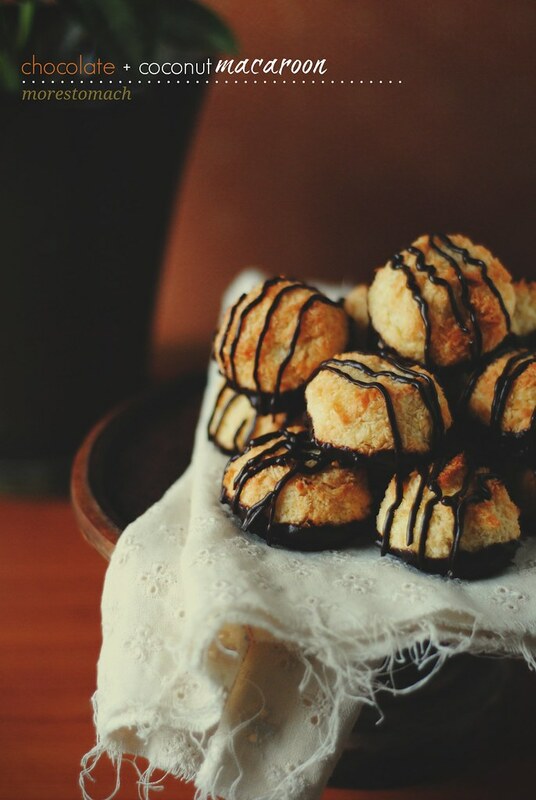 form macaroons as you want, into balls, or drop them via tablespoon on sheet. bake for 25 minutes, until golden brown. when cool, dip in melted dairy free chocolate, and drizzle over top. allow to cool. who else has made coconut macaroons? felicia of dish by dish, pyramid shaped! You poor dear. I am sorry! I found that wedding planning brought out the worst in everyone around me. Which brought out the tears in me. A day that is all about YOU becomes, like you said, all about everyone else’s expectations. I encourage you to stick to your guns, make it your day. To not forget why it’s really really happening — because you love dw. And that’s all that matters! It’s also good to allow some wallowing (and wine) (or whine). Home stretch girlfriend!! These look so good! Reminds me of the macarons my mother used to bake. sophie, it’s an eye opener for sure, education and for me, i wish i had known about all this before so that i could’ve been a better bridesmaid/person/guest/whoever when my peers were going through the process themselves. congrats to you and paula, how exciting and delightful. you’re right, thank goodness for perspective. I have no idea on wedding department but if you ever need to vent- i am here 🙂 i absolutely love macaroons and love that this does not call only egg whites..will be trying this soon. dixya, you’re sweet, thank you. the inclusion of the yolks in this recipe certainly makes for less stress of figuring out what to do with them. like i could handle another obstacle in my life right now! this is why we just up and married. no fanfare. no ceremony. just a judge and her two assistants. best decision i’ve ever made. btw, i could eat the hell out of those chocolate covered macaroons and not feel a shred of guilt. a courthouse nuptial sounds absolutely beautiful…sigh. felicia, thank you. we are reaching the homestretch. my tantrum is merely a blip in the road, if it were too smooth sailing i’d find complaint somewhere! wow! i’m so happy you made these and like ’em. i’m very much looking fwd to seeing your interpretation next week. 1. Those macaroons look lovely and 2.0 desperately wants some. 2. Don’t get me started on weddings. 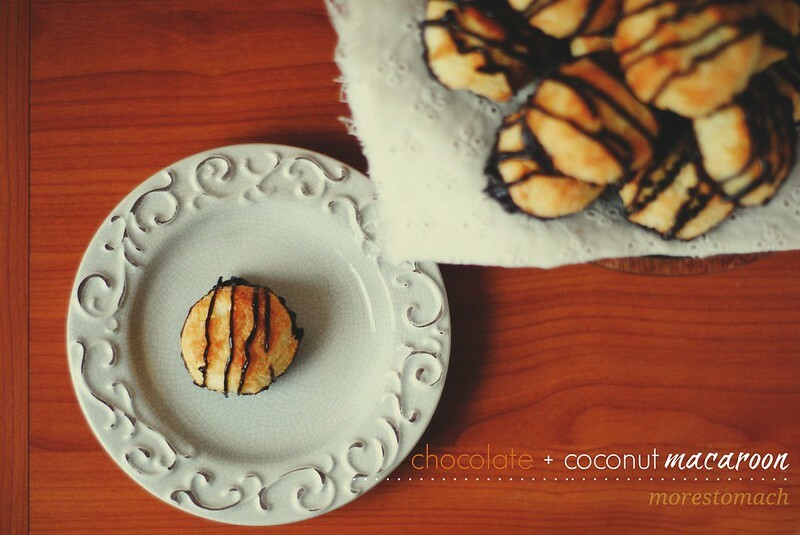 Coconut Macaroons will be the death of me one day. I love them and have no willpower to stop eating them once I start.